New York, NY — On Friday, March 13, the Global, United States and South Africa We Will Speak Out coalitions will co-host a parallel event, titled “Global Faith Perspectives on SGBV,” at the 59th United Nations Commission on the Status of Women (CSW) in New York. The presentations will highlight the diverse experiences and perspectives of a survivor, a practitioner, a faith leader and an academic, while inviting audience discussion and questions. Cost: Free and open to the public. UN pass is not required. Can’t make it? The event will be livestreamed here. An informal reception will immediately follow at the Episcopal Church Center (815 2nd Avenue, New York NY) for all attendees interested in continuing dialogue. Interview opportunity: The panel’s moderator, Rev. Amy Gopp of Church World Service and co-chair of WeWillSpeakOut.US, will be available to talk about the event at the reception immediately following. 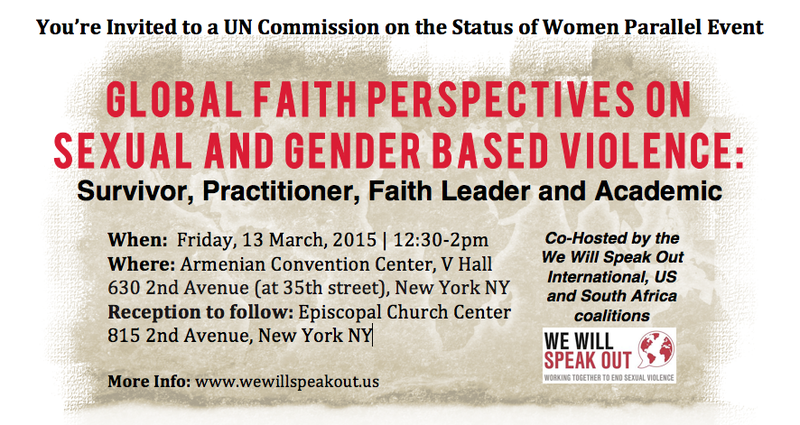 Social media: Follow the hashtag #faithvsSGBV for live Tweeting of the event. Representing a variety of contexts, panelists include Nikki Rineer of Lancaster, Pennsylvania, providing a survivor’s perspective; Constance Mogina, HIV/AIDS Development Officer for the Anglican Church of Papua New Guinea; Anglican Bishop Ellinah Wamukoya—Africa’s first female bishop—of Swaziland; and Kera Street of Harvard Divinity School. The Rev. Amy Gopp is an ordained minister of the Christian Church (Disciples of Christ). Gopp currently serves as the Director of Member Relations and Pastoral Care at Church World Service, a global and ecumenical relief, refugee, and development agency representing 37 member communions in the U.S. Formerly, she was the Executive Director for Week of Compassion, the mission fund of the Disciples of Christ. Rev. Gopp serves as Vice-Chair of the IMA World Health Board of Directors; Co-Chair of the Steering Committee of the We Will Speak Out U.S. campaign to end sexual and gender-based violence; writer for the Ecumenical One Great Hour of Sharing; and as a Trustee on the Union Theological Seminary Board of Directors. A past missionary and published writer, Amy holds a Master of Divinity degree from Union Theological Seminary, a Master of Arts degree in Conflict Resolution from Antioch University and a Bachelor of Arts degree in International Relations from American University. She can be reached with questions at AGopp@cwsglobal.org.